Many new designs utilize parts from previous designs to speed development and reduce costs. 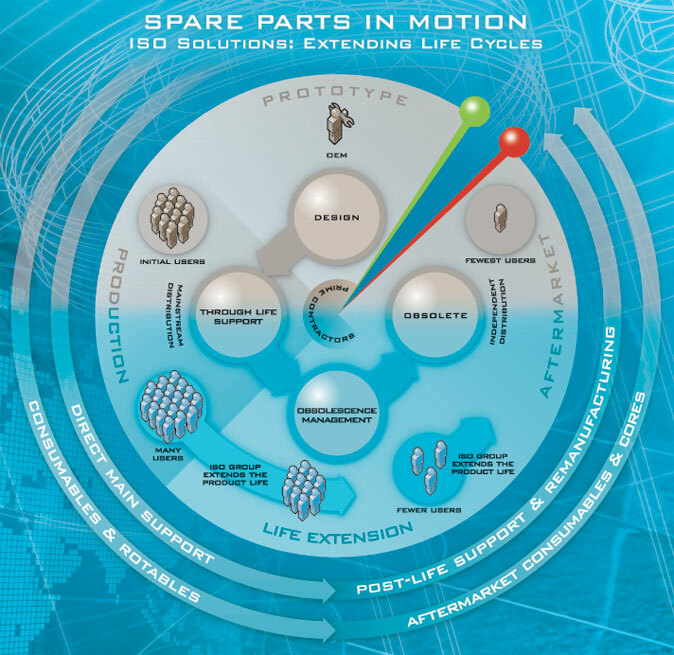 During the production stage of the product, the OEM provides “Through Life Support” for the spare parts for the maintenance of the product via its support network. ISO Group supplements the regular OEM support by offering an alternate source for common parts on the equipment and by offering a supply–chain direct from the OEM’s original suppliers to the End User wherever the supplychain allows. Further, ISO Group has relationships with many OEMs globally and supplies original OEM parts for many vehicles, simplifying the supply–chain for our customers. ISO Group supports overhaul, repair and re–manufacturing of both minor and major assemblies and parts. As products age, the OEM decreases its support network both to save costs and to allow for the introduction of new products utilizing new technologies. The End User often wishes to maintain their equipment in serviceable condition beyond the support period of the OEM and so they begin the “Life Extension” phase of their ownership. When products become obsolete, the OEM has officially stopped supporting the maintenance of the product. ISO Group becomes a vital maintenance supply–chain at this point when supply options are most limited, even though the End User must still maintain the highest level of quality in its operations.